Abstract: A career forester, Edward P. Cliff (1909-1987) moved through the ranks of the United States Forest Service, eventually serving as chief from 1962 to 1972. Following his retirement from the Forest Service, Cliff became active as a private consultant, focusing on projects involving work and travel in numerous countries. The collection includes nine looseleaf binders that contain Xerox copies and typescripts of speeches, articles, statements, press releases, and photographs documenting Cliff's career in the U.S. Forest Service. One carton and one manuscript box contain materials accumulated by Cliff during his post-Forest Service career as an international forestry consultant; contents include reading files, reports, and papers on such topics as the 1978 Food and Agriculture Organization's mission to Nigeria, agroforestry and soil conservation in Jamaica, and tropical forestry in Africa. Creator: Cliff, Edward Parley, 1909-1987. 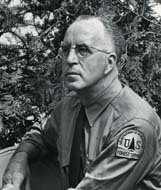 A career forester, Edward P. Cliff (1909-1987) moved through the ranks of the United States Forest Service, eventually serving as chief from 1962 to 1972. Following his retirement from the Forest Service, Cliff became active as a private consultant, focusing on projects involving work and travel in numerous countries. Edward Parley Cliff was born September 3, 1909, in Heber City, Utah. He received from Utah State University a B.S. degree in forestry in 1931 and an honorary D.Sc. degree in 1965. He began his career as a forester with the U. S. Forest Service in 1931 as an assistant ranger of the Wenatchee National Forest in Washington state. In 1935 he was put in charge of wildlife management for the Pacific Northwest Region of Oregon. From 1939 to 1944 Cliff served as supervisor of the Siskiyou and Fremont national forests in Oregon. He was assistant chief of the Division of Range Management in Washington, D.C., from 1944 to 1946, after which he returned to his home state to serve as assistant regional forester for the Intermountain Region of Utah until 1950. In the two years following 1950, Cliff served as a regional forester for the Rocky Mountain Region of Colorado. From 1952 to 1962 he served as assistant chief of the United States Forest Service and became chief in 1962. Serving as chief of the Forest Service from 1962 until 1972, Cliff experienced a decade of rapid change in the agency and in the country. He devoted much time to promoting a better understanding of public forest management problems with grazing interests and the timber industry, and especially with the general public. Public interest in the management of the national forests, as well as demands for numerous forest resources, expanded quickly during this era. He helped the Forest Service to develop a long-range forest research program. 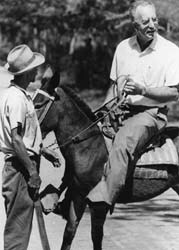 Important for the national forest recreationists was his vision in moving the Forest Service more into recreational improvements and programs. This shift responded to the increasing interest in hiking, camping, wilderness travel, mountain climbing, and many other national forest outdoor activities. The Wilderness Act of 1964 gave Congressional blessing to a new national wilderness preservation system and established more than nine million acres of previously designated "wild" or "wilderness" areas as the core. The Forest Service also became involved in the new Job Corps program by operating nearly 50 camps on the national forests; the nationwide natural beauty campaign; rural areas development, and the war on poverty. Cliff was a charter member of both the American Society of Range Management and The Wildlife Society. He was a fellow of the Society of American Foresters and a member of a wide variety of forestry organizations. He was an active participant at a number of World Forestry Congresses in the 1960s and 1970s. Cliff received distinguished service awards from Utah State Univerity in 1958, the U. S. Department of Agriculture in 1962, and the Tuskegee Institute in 1970. He was also the recipient of a number of other honorary awards given by various forestry and wildlife organizations. Upon his retirement from the Forest Service, Cliff became active as a private consultant, working on projects involving work and travel in numerous countries. Ed Cliff died in 1987. Source: Stroud, Richard H., ed., National Leaders of American Conservation (Washington, D. C.: Smithsonian Institution Press, 1985), 98-99. U.S. Forest Service Chief Ed Cliff at the Kirkland's Warbler Management Area, Huron National Forest, Michigan. June 1, 1963. The collection consists of nine looseleaf binders that contain Xerox copies and typescripts of materials documenting Cliff's career in the U.S. Forest Service. Volumes one through seven contain copies of Ed Cliff's "Speeches, Articles, Statements, Press Reports, and Photographs." The Forest History Society was one of several repositories in the United States to which Mr. Cliff sent sets of these indexed records. All photographs have been removed from the notebooks and placed in the Forest History Society Photographic Collection (in the file labeled "Cliff--from the Papers of Edward Cliff"). 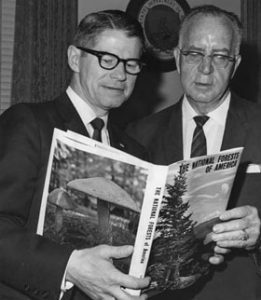 Terry West, Historian with the Public Affairs Office of the U. S. Forest Service, donated the final two volumes of material. One notebook is entitled "The Southern Forest Survey" and contains publications that resulted from a nationwide inventory conducted by the U. S. Forest Service in the 1950s and 1960s. The other volume is entitled "Legislative History: the Wilderness Act" and contains copies of the records of the legislative proceedings concerning Public Law 88-577. One carton and one manuscript box contain materials accumulated by Cliff during his post-Forest Service career as an international forestry consultant; contents include reading files, reports, and papers on such topics as the 1978 Food and Agriculture Organization's mission to Nigeria, agroforestry and soil conservation in Jamaica, and tropical forestry in Africa. (7 volumes) The front of each notebook holds an index listing the contents of that particular volume. (1 volume) The "Southern Forest Survey" volume contains reports published the United States Forest Service. The reports reveal information on the kind, amount, and condition of forest resources, as well as information on forest industries and wood production. The records are filed under one of three headings: "Resources by State,""Industry by Region," or "Industry by State." (1 volume) The "Legislative History: the Wilderness Act" volume contains copies of the records of the legislative proceedings concerning Public Law 88-577. The records are indexed and arranged chronologically from January 4, 1963 to September 3, 1964. An index and a general description of the law are filed in the front of the notebook. Includes publications by the United States Forest Service on such topics as tropical forest utilization, deforestation in developing countries, and housing construction; publications from other government agencies on such topics as international forest resources management, timber as a renewable resource, and tropical forest resources; and unpublished papers and reports on forestry in developing countries, agroforestry in the American South, and management of United States national forests. Includes papers and reports of various projects and meetings dealing with economic development of Africa including forest industries. Organizations represented: FAO, World Bank, United Nations Economic Mission for Africa. Agrisource was a publication highlighting agribusiness potential in developing nations. Cliff was on the board of editorial advisors. Agency for International Development, 1982. Includes a schedule of activities for AID's First Annual Forestry Assistance Operations Review, accompanied by an announcement of the Annual Meeting of the International Society of Tropical Foresters. Holds correspondence, memos, and conservation program reports. Holds membership directories, correspondence, and materials relating to the dontation of books, reports, and other material to the Society. Society of American Foresters, 1938-1986. Holds correspondence, reports, and memos. Topics include litigation between the society and the Renewable Natural Resources Foundation about the ownership and development of real estate purchased by RNRF with funds borrowed by SAF and a 1984 Scandinavian Study Tour. Correspondence, reports, and memos relating to Cliff's work in Alaska as a volunteer consultant. An Evaluation of the Forest Resources Management Project of the Agency for International Development Bureau for Science and Technology Office of Forestry, Environment, and Natural Resources - Cliff, Edward; Gallegos, Carl; McCarty, Harry. 1982. Forest Industries Development in Latin America: A Review of Activities of the Forest Industries Advisory Group and Proposals for Further Action. A Report of the Preparatory Assistance Mission, UNDP/FAO (RLA/74/090) - April, 1975. Public Land Law Review Commission Revisited: Timber Resources - Cliff, Edward P. March, 1977. Reorganization Study of Federal Natural Resource and Environmental Management Functions, Prepared by the Natural Resources/Environment Division, President's Reorganization Project, Office of Management and Budget, 1978-1979. Contains draft and final copy. A Review of Activities of the ECA/FAO Advisory Group for Forest Industries Development in Africa RAF/68/444. Report of the UNDP/FAO Review Mission, March 1976. World's Resources and Reserves and U.S. Policy - Timber. Cliff, Edward P.
[Identification of item], Edward Parley Cliff Papers, Library and Archives, Forest History Society, Durham, NC, USA..